No more need to worry who is stealing your contactless card details when in public. It was a conversation with a friend in Dubai that prompted handbag designer, Shona Easton, to investigate designing a purse with an ‘anti-scan’ interlining. Shona’s friend was scammed out of £1000’s when thieves scanned her credit card through her handbag! Luckily her bank sent her a text message every time her card was used, so when she heard her phone ping several times in a row, she immediately rushed to read the messages, thinking the kids had fallen ill at school or something worse! It wasn’t the school, it was her bank telling her she’d just spend £x here and £x there. Of course she hadn’t! She’d been a victim of contactless payment fraud as her card wasn’t kept in a card-safe wallet or purse. Shona got designing and the Bertie and Annie purses were born, both fabulous roomy purses that hold up to 12 credit cards. 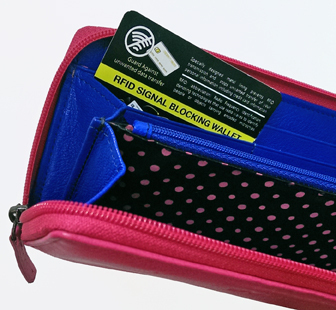 That’s 12 cards that are safe from scammers because of the special anti-scan lining inside the purse. With more designs on the way, including 2 styles of men’s wallets, credit card cases and individual card covers, there’s a style to suit all tastes this Christmas. Are your contactless payment cards safe right now? * Shona Easton is a handbag and accessories designer with over 25 years' experience in the fashion industry in the UK and overseas. She set up her own label in 2002 after she left Next where she was head designer for handbags, jewellery and accessories. Contemporary style and timeless design is the hallmark of the Shona Easton brand – a brand that focuses on stylish, beautifully designed and ethically made handbags.